Don't let crafting and commerce get in the way of the guns. The wingstick is a quality weapon. In Rage you can tap Q to send one of these tri-bladed boomerangs arcing out towards an enemy's head, with just a touch of curve to let you decapitate an enemy in cover. Sometimes the wingstick swoops back into your inventory, but sometimes it smashes and clatters to the floor in bits. That's too bad, because you're going to have to fork out 25 in-game bucks for a new one, or look in some bins for enough bits to craft one. For some reason from about 2007 tight resource management started to become important in first-person shooters. Crysis gave us amazing super powers and half a Duracell to power them. Bioshock gave us magic powers and a thimble of Eve to power them. In Rage you need to engage with a dull crafting system or shops to keep your cool gadgets primed. It's a real shame, because while Rage has a lot of problems (boring vehicle bits, pointless open world zones, terrible texture-popping) the guns and gadgets are fantastic. You start with one of PC gaming's crappiest pistols, but if you fight past the NPC dialogue and the driving bits you eventually get a shotgun that fires microrockets, a crossbow that fires mind control bolts, and a minigun that fires hadoukens. As well as wingsticks you eventually get turrets, spider bots and RC car bombs. A lot of Rage 2's manic energy is locked away deep inside the game, hidden behind a dusty, familiar vision of a Mad Max style post-apocalypse. You start with one of PC gaming's crappiest pistols, but if you fight past the NPC dialogue and the driving bits you eventually get a shotgun that fires microrockets. It is quite beautiful once the textures have loaded, but Fallout, Borderlands, Mad Max and many more games have done deserts to death. 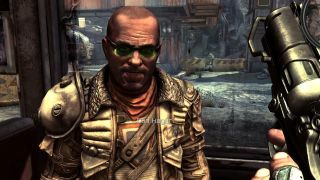 The big problem with Rage is that it imposes the scarcity of a post-apocalyptic scenario onto a game that would be much better as a dedicated corridor shooter. Is it interesting to keep track of my wingstick supply in combat, or to know that I've only got three revolver rounds left? In Stalker—a game about tense encounters with highly lethal enemies—absolutely. In a game that assaults you with hordes of crazed British punk fans, absolutely not. It's just annoying. The good news is that the sequel may have taken these lessons on board, if the first Rage 2 trailers are to be believed. The zany wastelander vibe feels Borderlands-lite, but scenes of a high-tech double jump rocket launcher attack gives me favourable flashbacks to the fantastic 2016 Doom reboot. Now there's a game that's happy to give the player big toys with few constraints. The more games move towards heavily padded open world settings, the more I appreciate a focused game about guns vs. mutants and monsters. Give me great weapons, plenty of ammo, and let me loose on the wasteland without constraint.